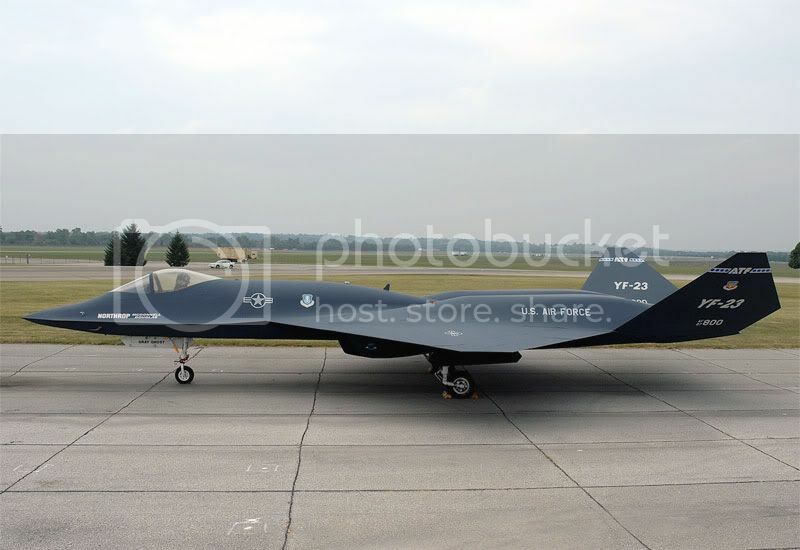 The Northrop/McDonnell Douglas YF-23 "Black Widow II" — unofficially named by Northrop after its P-61 Black Widow — was a prototype fighter aircraft designed for the United States Air Force. It was passed over in favor of the YF-22 that has entered production as the F-22 Raptor. The YF-22 and YF-23 were competing in the USAF's Advanced Tactical Fighter program. Conceived in the early 1980s, to specify a replacement for the F-15 Eagle, contracts for the two most promising designs were awarded in 1986, with the YF-23 delivered in 1989 and the evaluation concluded in 1991. Many levels of subcontractors were lined up on each side of the decision, and some on the losing side did not survive long afterwards. 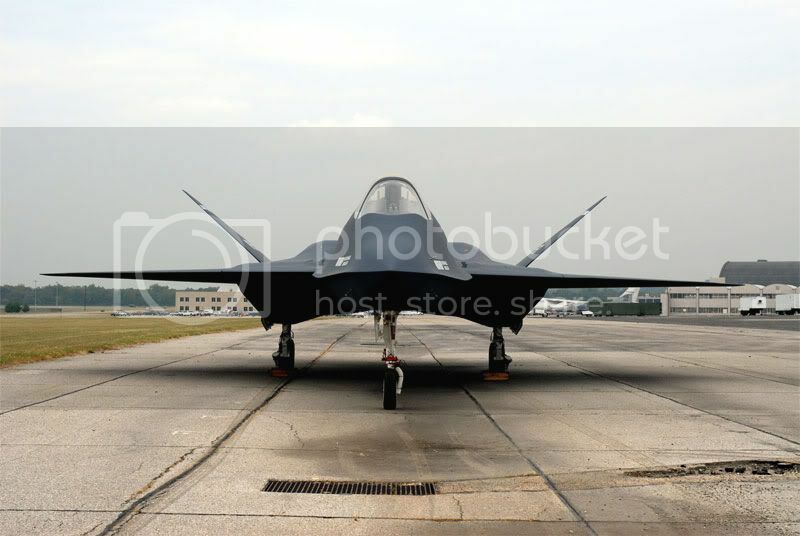 The YF-23 was designed with stealth as a high priority and was a highly unconventional-looking aircraft with diamond-shaped wings blended with the fuselage and a V-tail. The YF-23A met USAF requirements for survivability, supersonic cruise, stealth and ease of maintenance. 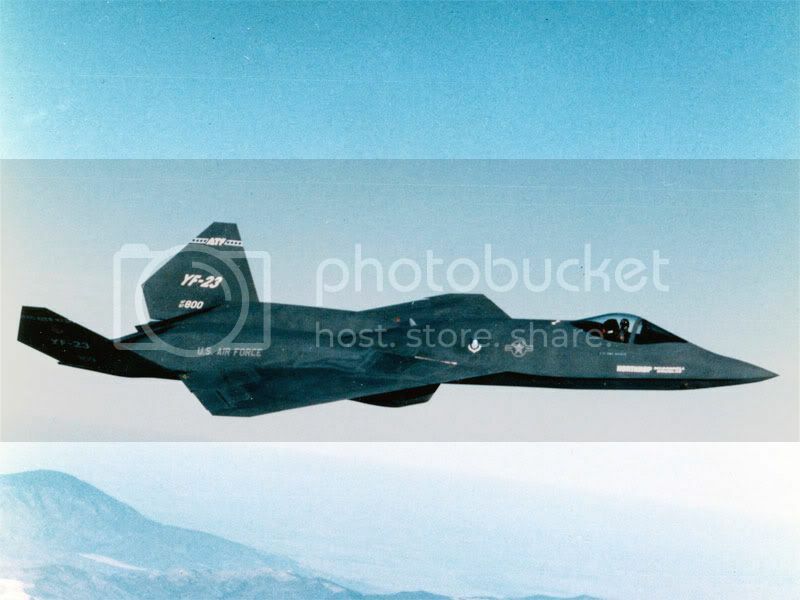 However, the YF-22A was more maneuverable than the YF-23A and won the competition in April 1991. 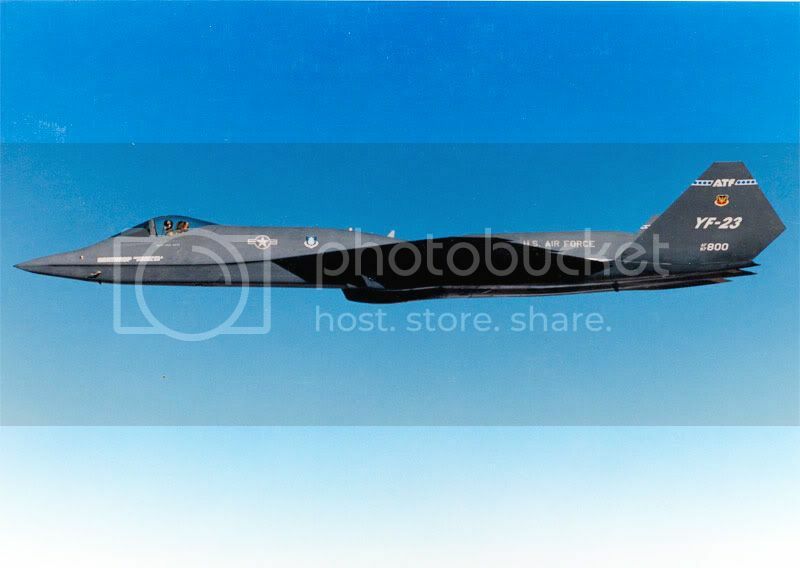 Another factor was that the YF-22A was also seen as more adaptable to the Navy's Navalized Advanced Tactical Fighter (NATF), though as it turned out the Navy abandoned NATF a few months later. Although the precise results of the evaluation are not yet public knowledge, it is often claimed that the YF-23 was faster and stealthier than its competitor, but the USAF chose the YF-22 due to simply being more conventional, higher subsonic maneuverability, longer range, and better warning systems. Others point out the YF-23's comparatively flawed weapons release mechanism wherein missiles are stacked on racks, and a weapons jam of a lower-positioned missile could prevent the firing of the missile above it. In any case, the decision is still widely debated. Two aircraft were built. 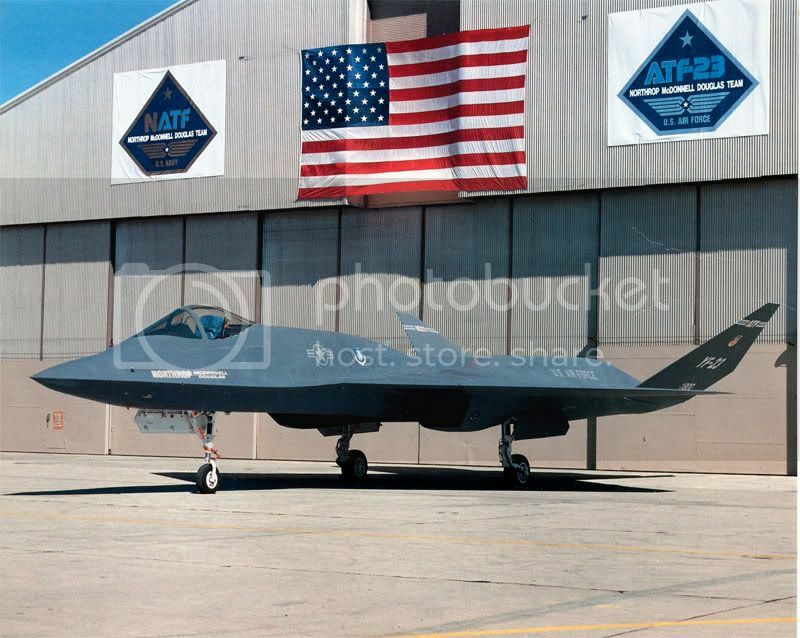 After losing the competition, both YF-23 prototypes were transferred from Norththrop to NASA's Dryden Flight Center, at Edwards AFB, California. The engines were removed; NASA had no plans to perform flight tests with the airframes, but did plan to use one of the two aircraft to study strain gage loads calibration techniques. In the end, however, both aircraft remained in storage until the summer of 1996, when the aircraft were transferred to museums. Aircraft PAV-2 was in exhibit at the Western Museum of Flight in Hawthorne, California and PAV-1[verification needed] was recently moved to the National Museum of the United States Air Force near Dayton, Ohio, where it sits along side the Boeing X-32 in the Aircraft Restoration Hangar. Aircraft PAV-1[verification needed] is now on display in an outdoor parking area at Northrop Grumman's production facility in El Segundo, California. In late 2004, Northrop Grumman proposed a YF-23 based design for the USAF's interim bomber requirement, a role for which the FB-22 and B-1R are also competing. Aircraft PAV-1 was moved from the Western Museum of Flight to Northrup's plant for refurbishment after being on outside display for more than a decade. Instead, Northrup used the aircraft to create a full scale model of its proposed interim bomber before restoring it back to its original configuration and returning it to the Western Museum of Flight. The interim bomber requirement has since been cancelled in favor of a more long-term, permament bomber replacement requirement; however, the same YF-23-derived design will likely be adapted to fulfill this role as well.